The transport company Direct City Network (DCN) has submitted a plan to Transport for the North (TfN) for a “MagLev” train system between Hull and Liverpool that could reach speeds of up to 350 mph. 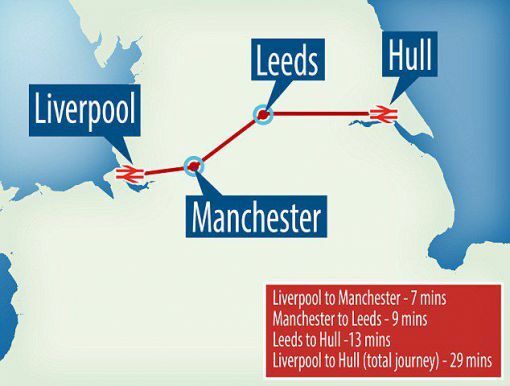 It could connect the 31 miles from Manchester to Liverpool in only 7 minutes and the 111 miles from Liverpool to Hull in 29 minutes. The initial proposal is for a train line between Manchester and Leeds. It could be extended to include Liverpool and Hull. The train would run via the Magnetic Levitation (MagLev) technology. It will use electromagnets to levitate the train above the track which enables to reach higher speeds thanks to reduced friction. MagLev trains are already operating in Asia and a world speed record of 373 mph was set in Japan on a test track. The line will need to be underground and the system will use passengers pods or capsules rather than a long train. Source: DailyMail, Liverpool Echo, Metro. Featured image credits: Hermann Luyken, licensed for reuse under this Creative Commons Licence.